One of the surprises I had when I was involved in the Cook et al (2013) paper was how many abstracts there were that hardly mentioned anthropogenic global warming. This was despite them having been selected using the key words global climate change and global warming. When we got to the stage of tabulating and plotting the ratings over the 1991-2011 period, what was even more surprising, to me, was that the proportion of abstracts that took No Position (NP) actually rose from about 50% in the early 1990s to about 65% in 2002, after which that proportion stayed more or less the same for nine years. It wasn’t immediately obvious to me how this squared with the increasing knowledge and generally reduced uncertainties expressed in successive IPCC reports. The other investigation we did was to ask the authors of the articles to rate their papers on the same scale. Here the overall percentage of NP was lower, about 35%. Not all authors responded to our email queries, so the sample size is smaller than for the abstracts. Also, it was harder to track down email addresses for researchers in the early 1990s, so the sample is particularly small then. Nevertheless, the rising proportion of NP papers is if anything a little more marked here, rising from around 20% in the 1994-1999 period to around 35-40% in the 2001-2011 period. The difference between abstract and paper NP proportions is not surprising: the abstracts are reserved for key results and the available space there tends not to be wasted telling everyone what the prevailing paradigm is. Also, as confidence in the paradigm grows over time, a larger proportion of papers might consider the attribution of global warming to be an established fact and not something that needs to be endorsed even in the body of the paper itself. We might well expect to see the same thing in other subjects: for example, life scientists no longer need to affirm evolution through natural selection, it has become settled science; geologists take plate tectonics for granted today, although they would not have in the 1960s when there was a scientific revolution underway. Rising NP proportions in climate science papers, contrary to intuition, might well signify rising confidence among researchers that human emissions are a main cause of global warming—something that just does not have to be reaffirmed every time the subject of changing modern climates is discussed. I wondered, in 2013, what the endorsement rate of plate tectonics would look like in a contemporary geological journal, so I did a little pilot study of my own. But before I get to that, I’ll look briefly at the late stages of the plate tectonics revolution. This was unlike the often rancorous recent discussions over the reality and attribution of modern climate change, mainly because the science of tectonics was not tied to politics or commercial interests. The reader should be forewarned: what follows is no rigorous study, just an opinion piece based on a few references, with some personal observations—nay, anecdotes—offered along the way. 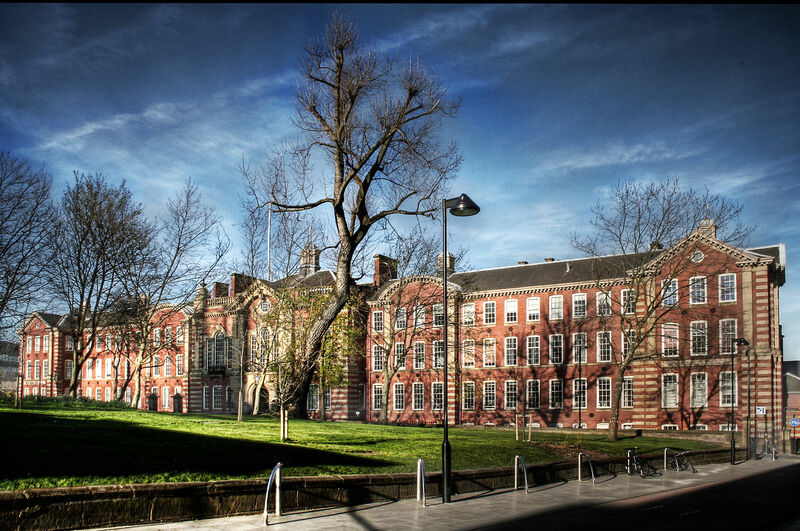 I sat in my first ever geology class at Sheffield University in 1972. It was taught by department head Professor Leslie Moore, an eminent palynologist, a good teacher and a Continental Drift denier. One of the few details I remember from the course was him pointing at a map of the North Atlantic and booming out in his Somerset accent: “People will tell you that Greenland and Scotland were once joined together. To that I say: Rubbish!” He had sufficient control over his department to not allow a dedicated course in plate tectonics to be taught there, but he couldn’t stop the staff teaching bits of the new unifying paradigm in classes on structural geology, igneous petrology, seismology, stratigraphy, palaeontology and so on. It was up to us students to put it all together. The revolution was over, but some of the old aristocrats were still trying to run the place as they always had. Professor Moore knew more about ancient pollen than he did about the psychology of eighteen-year-olds and, by trying to stop us from taking plate tectonics seriously, he just made it more intriguing. He was the first and last plate tectonics denier that I encountered over the following four decades of my career as a geologist. 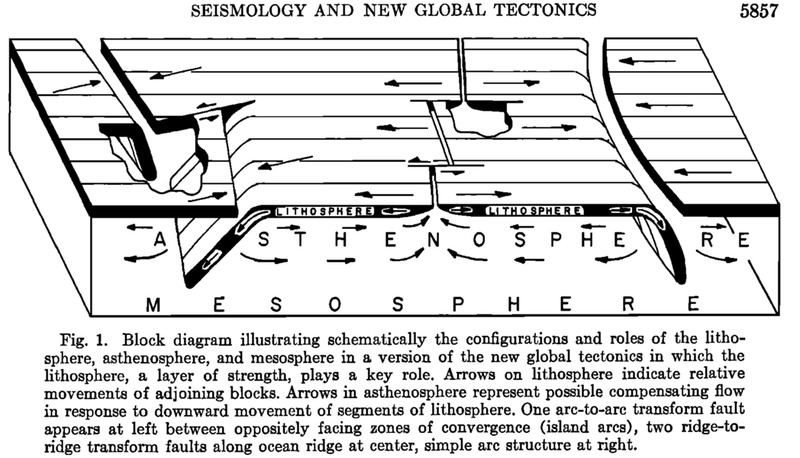 But to be fair to him, the year he taught me was 1972, just four years after the publication that for many sealed the matter: Isacks, Oliver and Sykes (1968) Seismology and the new global tectonics. This paper included the seminal diagram that was the geological equivalent of the Keeling Curve or Hockey Stick graph, the easy-to-grasp figures that made converts out of non-specialist waverers. Four years is the duration of an undergraduate program and less than the six-year interval between IPCC reports, so we can perhaps forgive Professor Moore for being a little behind the times. I attended a geological conference in Baku, Azerbaijan in 1999, just a decade after the collapse of the Soviet Union (conference proceedings, my abstract). 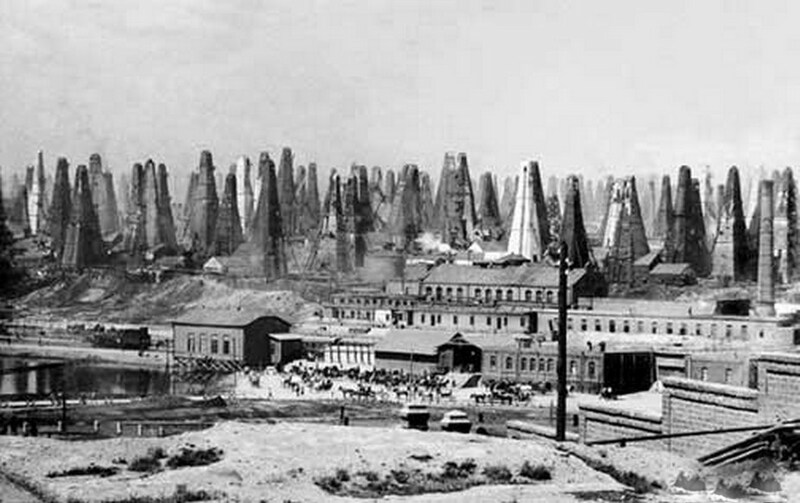 Baku was starting to become an oil-fired boomtown (for the second time, it was the original oil boomtown). The young Azeris and Russians who lived there were embracing western manners, clothes, language and technology with ease, while the older generation was adapting awkwardly. At the conference, some of the older geologists gave talks showing hand-drawn maps and cross-sections that looked nothing like what we were used to seeing in the west. They struggled to adapt the new—to some of them—global tectonics to their old models. 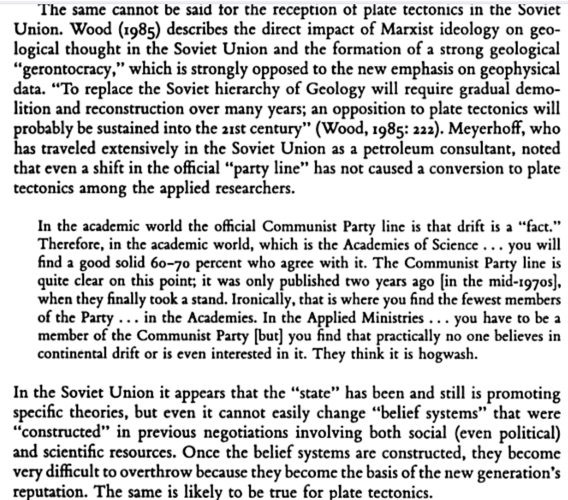 Plate tectonics, as the dominant paradigm, came late to the Former Soviet Union (FSU). According to some western writers, like Robert Muir Wood and John A. Stewart the resistance to change was not an ideological obstacle like some form of geological Lysenkoism—the Communist Party itself had officially embraced plate tectonics by the 1980s—but rather the influence of some powerful and stubborn geologists who presided over a hierarchical research and teaching system. There was evidently a stronger gerontocracy in the Soviet Union than there was at the University of Sheffield. However, both Muir Wood and Stewart were writing in the 1980s and didn’t see the Soviet Union collapse coming. Their prediction that opposition to plate tectonics would be sustained into the 21st century didn’t happen for the most part. There were a few contrarian holdouts in the West, too, like the American geologist Art Meyerhoff. But they were rare and generally well tolerated by the mainstream. Having a small number of genuine and stubborn sceptics around can be salutary. Mainstream scientists sometimes tend to turn a blind eye to inconsistencies that are very apparent to dissidents, who can be quick to raise awkward questions that are worth answering. If you wanted to get ahead as a geoscientist in academia or the extractive industries in Europe or North America, however, you pretty much had to adopt the plate tectonics model enthusiastically. For some doubters, accepting the scientific consensus might feel coercive if you want to participate in the research community, but most scientists are naturally drawn rather than pushed into it. In my own experience, when the existing model is rusting and there’s a shiny new one available, even a freshman will ignore his professor. Plate tectonics is settled science. To be sure, there are some big unanswered questions and researchers argue passionately over important details. 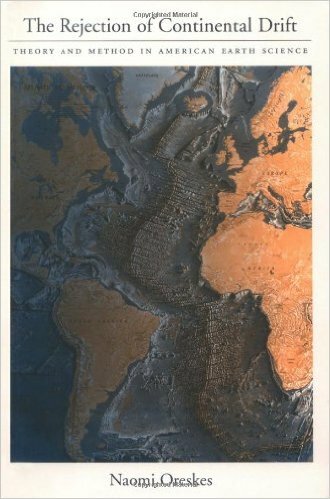 But nobody today disputes that the plates move, that ocean crust is formed at mid-ocean ridges and consumed at subduction zones, or that displacement is transferred at transform faults, or that mountains form when continents or fragments of continents collide. Unlike evolution and climate science, plate tectonics does not threaten anybody’s religious, political or commercial interests. Only the geologists who had invested their careers in alternative fixist hypotheses felt that their identities or reputations were threatened. Most of them are now dead. So, how does the consensus on plate tectonics express itself in the modern scientific literature? I had a quick look at a year’s worth of abstracts from the Bulletin of American Association of Petroleum Geologists. I examined 68 abstracts from the 12 monthly issues of the AAPG Bulletin for 2010. Not only did I look for explicit or implicit endorsement or rejection of plate tectonics, while I was at it, I also examined opinions expressed on the biotic (or not) origin of gas and oil. The abiotic origin of petroleum has had some distinguished proponents in the west, such as the astrophysicist Thomas Gold, and there are still many geologists in the FSU who adhere to the idea. Glasby (2006) has a good review. There is some small amount of methane that has origins in the mantle, but western petroleum geologists (in my own professional experience) are overwhelmingly of the view that gas and oil are nearly exclusively derived from the thermogenic or biogenic decomposition of organic matter buried in sedimentary rocks. I was generous when it came to what constituted implicit endorsement of either plate tectonics or biotic petroleum origins. It was sufficient for the abstract only to mention a plate tectonic process (e.g., displaced continents, sea-floor spreading, continental collisions etc.) to earn an “implicit endorsement” rating. For the biotic origins, it was enough simply to mention a sedimentary source rock. Criteria for identifying explicit endorsements of either theory were not required, there just weren’t any abstracts that came close to expressing such a claim, nor were there any rejections. Altogether, I found 5 abstracts (7%) with implicit endorsement of plate tectonics and 18 abstracts (26%) with implicit endorsement of the biotic origin of gas and oil. The rest of the abstracts were “no position”. Using the same method to calculate a consensus percentage that we used in Cook et al. (2013) would give 100% consensus for this small and unrepresentative sample of the geological literature. For some critics of the methodology of Cook et al. who claim that “implicit endorsement” abstracts cannot be interpreted as endorsements, this would mean that 0% of contemporary petroleum geologists endorse plate tectonics or the biotic origins of petroleum, which is absurd. I’m fairly sure that if the sample of the contemporary scientific literature was wider and included journals from the FSU, you would find a few endorsements of the abiotic origins of petroleum. Going back in time to the 1980s, there would likely be (based recollections of my own non-random reading of the literature during my career) a handful of abstracts questioning plate tectonics and, certainly, many more affirming the theory explicitly. Exactly what the literature of the 1960s and 1970s would look like during the big shift from majority rejection of continental drift to near-universal acceptance of plate tectonics is something I would like to see. Even during that turbulent period, I would guess that the many geoscience papers that focussed on local phenomena would express no opinion on global processes. But among the papers that discussed geology in a global context, I would predict that that there would be both rising endorsements and falling rejections of plate tectonics. There would also eventually be a rising trend of “no position” in abstracts and papers as the big debate gradually became a matter of historical interest only. I don’t expect anyone to be convinced by my tiny survey, nor by my anecdotal recollections or speculations. However, I was able to conclude that doing a major survey of a proper sample of the recent scientific literature would not be terribly instructive (and it would also be a ton of work). Plate tectonics is real and oil and gas come from buried organic matter. Everyone knows those things and there’s nothing much to be gained by expressing that opinion inside a scientific journal or outside of a textbook or classroom. It just goes without saying. I was unaware before I read Naomi Oreskes’ excellent book The Rejection of Continental Drift how strong and hostile the rejection of the hypothesis of continental drift was in North America prior to the 1950s. Perhaps because of my experiences as a British student and, knowing of the strong objections of British geophysics grandees like Sir Harold Jeffreys (not to mention Leslie Moore), I had assumed that there was a fair debate between advocates and rejectionists on both sides of the Atlantic, with the advantage on both sides given to the rejectionists until the data on the oceans turned the tide in the 1960s. This was not so, as I learned from Oreskes, American geologists were almost universally scornful of the drifters in the first half of the century. The paradigm shift in the Earth Sciences in the 1960s is often used as an example by climate change contrarians to argue that the science is never settled. Certainly, American geologists had formed a strong consensus against drift, but for the Europeans no such consensus existed: a real and unresolved debate about continental drift had been going on there for decades. In contrast, one of the features of the modern consensus on anthropogenic climate change is that it is nearly universal across international borders. What is astonishing about the plate tectonics revolution is that as the data came in—much of it collected by “fixist” geophysicists with the US Navy—the scientists rapidly and eagerly changed their minds, and a new consensus emerged in the space of a few decades. This belies the frequent accusation that scientists are conformists who stick to conservative topics just so that they can get funding. In fact, nothing attracts scientists’ attention like novelty and the hint of a new paradigm being born. Richard Alley, as always, expresses this with verve. If someone had a great idea that would overturn modern climate science—and it would have to be a Great Idea, given the vast amount of consilient observations and supporting physical theory—they would not want for financial backers. Heck, even some manifestly not-so-great ideas have attracted funding. Nobody sane wants man-made climate change to be true. The Earth revolves around the Sun; organisms, including the Great Apes, evolve by natural selection; the Earth is billions of years old; the tectonic plates of the Earth are in constant motion; humans adding CO2 to the atmosphere now warms the climate more quickly than natural cycles do. Like it or not, nearly all scientists believe these theories to be true and it’s perverse to doubt any of them. This entry was posted in Uncategorized and tagged Consensus, Plate Tectonics. Bookmark the permalink. Surely you’re aware of James Lawrence Powell’s much larger ongoing study along the same lines as your own experiment? If not, take a look at it at your earliest convenience. His point is that a better and more accurate metric of how widely held a scientific consensus is to measure the number of published papers that explicitly reject it. Powell also uses the example of plate tectonics. Yes, I am well aware of James Powell’s study. In fact, we have a formal reply to it in preparation, so I deliberately did not mention it here. I don’t want to give too much away, but here’s a brief preview: although he makes some interesting points, I believe his method overstates the consensus and he wrongly assumes that everyone who does not make an explicit rejection of AGW endorses it. I also thought he overstated the consensus (at >99.9% how could this not be the case?) but thought the logic of his approach was sound and avoided some of the pitfalls of direct surveys or less direct inferences of consensus support. I know if I thought I could knock a hole in some widely-held piece of geological dogma I’d be eager to demonstrate it. But I’m embarrassed by my opening comment. Of course you’re a co-author of the paper he was commenting on, which I’ve read and have on the computer I’m using now. Sometimes when you reply to a blog post you forget whose blog it is, I guess. Anyway, I hope both the comment and reply make it into print and add clarity to the debate. If so, a refreshing change from the Watts, Tol & Curry approach. There probably is a bit of a mismatch between people who agree with the prevailing point of view not bothering to mention it and those that don’t agree. If you write a paper that disagrees with the consensus you ought to be sure to highlight it, because it’s a big deal. On the other hand, there was at least one case in our survey of abstracts where a well-known contrarian wrote that he had deliberately used ambiguous language to smuggle his paper past the reviewers. He nonetheless complained that we had rated his abstract incorrectly, which is pretty much the definition of chutzpah. No need to feel embarrassed. I felt a little awkward writing on a subject without acknowledging that James Powell’s comment had at least partly prompted me to do it. Perhaps I should have been more upfront to avoid any confusion. Contrarians have tried to include the group that does not explicitly endorse AGW to understate consensus. So while Powell’s study may overstate the consensus, it does show that “two can play that game”. ‘“What we hope is that the current patterns of temperature change prove distinctive, quite different from the patterns of natural variability in the past,” Barnett told [Fred Pearce] in 1996. Even then they were looking for a hockey stick. A lot of insane people in climate science, by your reckoning, Andy! Those citations are lame, even by your standards, Brad. Only the first one from Jones supports your case and is is an off-the-cuff private remark to his friends, taken out of context. No more of this, please. Holmes was certainly a great figure in early twentieth-century geology, with his major contributions to radiometric dating and his insights into convection. I still have his fat, red-covered textbook on my shelf. While many European geologists were certainly correct in their early advocacy of continental drift, I don’t think it’s quite right to say that they were early adopters of plate tectonics. That would have required more knowledge, in particular, of the nature of the oceanic crust and seismology than would become available until the 1950s. Nevertheless, the observational, if circumstantial, evidence for the mobility of the crust was strong and its surprising that it was so vehemently dismissed for so long by many geologists in N America.